In addition to proteins that are encountered at inter-epithelial cell contacts, such as JAMs and CD99, the endothelial junctions express specific marker proteins such as PEC AM-1 and VE-cadherin (vascular endothelial cadherin, also known as cadherin 5). All these adhesive receptors, being localized at the endothelial cell-cell junctions, are on the path of leukocyte emigration. PEC AM-1 is a transmembrane glycoprotein of the immunoglobulin gene superfamily expressed at the surface of monocytes, neutrophils, and naive T lymphocytes and also concentrated at endothelial cell-cell junctions. It possesses an extracellular region consisting of six Ig-like domains and a cytoplasmic tail exhibiting a variable size due to differential splicing  (Figure 2). Figure 2 Schematic structures of the adhesion receptors expressed at endothelial cell-cell junctions. VE-cadherin belongs to the Cadherin superfamily and PEC AM-1 and JAM A, B, C, D to the immunoglobulin family, whereas CD99 is a unique molecule. ECi: Ig domains. Pro and Trans correspond to the propeptide and the transmembrane domain of each molecule. Cyt designates their cytoplasmic parts. The extracellular domain of PECAM-1 binds very weakly to PECAM-1-expressing cells because of its low affinity for its cellular target. Once expressed at the surface of liposomes, however, PECAM-1 is able to promote the association of these vesicles. It can be deduced that PECAM-1 is able to interact homophilically when it is highly concentrated at the surface of the membrane. To define the immunoglobulin domains responsible for mediating homophilic binding, several chimeric proteins with one, two, three, four, or five Ig domains deleted were elaborated. Using an adhesion assay, these studies establish that the two N-terminal Ig domains EC1 and EC2 of PECAM-1 (Figure 2) are both necessary and sufficient to mediate homophilic interactions, but maximal stable binding requires all six extracellular Ig domains of PECAM-1. These homophilic interactions occur at the junctions between endothelial cells and may be involved in the diapedesis of leukocytes by creating heterotypic links between leukocytes and endothelial PECAM-1 molecules. However, PECAM-1-deficient mice suffer from only limited effects on the transendothelial migration of leukocytes. This probably results from an existing redundancy between adhesion molecules involved in leukocyte transmigration. Similarly to other adhesive receptors of the immunoglobulin superfamily, PECAM-1 is also able to establish het-erophilic interactions with integrins, particularly with aVp3 expressed at endothelial cell-cell junctions (Figure 4). Endothelial cells express both N-cadherin and VE-cadherin at their surface. Despite similar expression levels, only VE-cadherin is expressed at cell-cell junctions, whereas N-cadherin is spread over the cell membrane. In fact, whereas VE-cadherin mediates homotypic interactions resulting in endothelial cell-cell attachment, N-cadherin seems to essentially participate in the anchorage of other N-cadherin-expressing cells, such as pericytes, to the endothe-lium. These N-cadherin-mediated interactions may allow the formation of the cellular multilayer structure required for the elaboration of shear stress-resistant vessels. 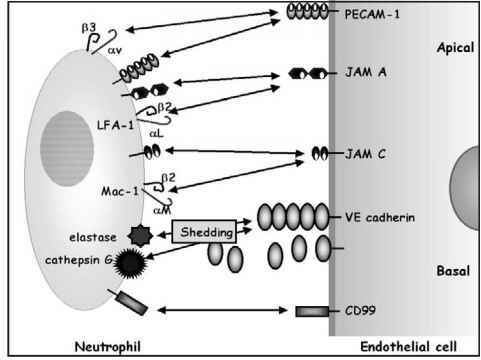 This review will focus mainly on VE-cadherin as this is the major cadherin molecule of endothelial cell junctions. Figure 3 VE-cadherin and its intracellular partners elaborate the adherens junctions between endothelial cells. VE-cadherin molecules elaborate homophilic interactions that are able to link neighboring endothelial cells. Their extracellular domains self-associate to form a hexameric structure at the endothelium surface while their cytoplasmic tails bind proteins such as b catenin. VE-cadherin is anchored to the actin cytoskeleton (—) by the fixation of a catenin on VE-cadherin-bound b catenin. homophilic and homotypic interactions between the cad-herin ectodomains must be strengthened by intracellular interactions involving the cytoplasmic tails of cadherins. This domain exhibits two highly conserved regions: the first one, located at the C terminus of the cytoplasmic domain, binds b-catenin. The second one, close to the membrane, interacts with another catenin protein named p120. The anchorage of cadherins to the actin cytoskeleton is indispensable for the development of strong cell-cell adhesion. This connection is mediated by a-catenin, which interacts on one hand with cadherin-bound b-catenin and on the other with the actin cytoskeleton (Figure 3). We demonstrated that VE-cadherin participates in the maintenance and restoration of the endothelium integrity. Moreover, we also proved that VE-cadherin elaborated hexameric probably antiparallel structures absolutely required for the elaboration of stable endothelial adherens junctions  (Figure 3). The existence of an unknown cadherin at the surface of T cells was discovered in 1996. Similarly to classical cadherins, this new cadherin is able to bind a, b, and g catenins and may interact with VE-cadherin, thus facilitating the homing of T cells. CD99 is a 32-kDa glycoprotein, discovered in 1988 and expressed at the surface of all human T cells and many other hematopoietic cell types such as platelets, neutrophils, and red blood cells. 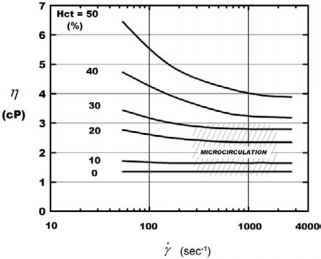 It is also found at the lateral borders of confluent monolayers of human endothelial cells similarly to PEC AM-1 and VE-cadherin. CD99 shares no structural homology with any known family of proteins. Recent studies established that CD99 is involved in the control of the transport of newly synthesized MHC class I molecules to the plasma membrane in B lymphocytes, suggesting that it may be associated with the post-Golgi trafficking machinery. In T cells, CD99 exists under two different isoforms, 32kDa and 28kDa, respectively, generated by alternative splicing. The 32-kDa form corresponds to the full-length protein, whereas the 28-kDa form exhibits a deletion within its cytoplasmic domain. These two CD99 forms can elaborate homophilic associations, leading to the formation of homodimers and heterodimers. Recently, it was established that the heterodimeric form, created via the formation of a covalent disulfide bridge between the cysteines 155, is able to induce T-cell apoptosis. It can be deduced that the elaboration of these dimers modulates the fate of T cells via the transduction of a proapoptotic signal. Analysis of the cytoplasmic tail of CD99 reveals a lysine triplet (K151K152K153) that may function as a putative binding site for ezrin/radixin/moesin. These proteins are known to link surface proteins, such as E selectin and ICAM-2, to the actin cytoskeleton. JAMs form a new Ig-like superfamily of adhesion receptors whose first member, called JAM A, was only discovered in 1998. Since that time, three other members have been described as JAM B, C, and D . (JAM D is also named as JAM 4 in the literature.) They contain two extracellular immunoglobulin-like domains, a transmembrane domain and a relatively short cytoplasmic tail (Figure 2). Although all JAMs localize at endothelial cell-cell junctions and more precisely at tight junctions, they display different cellular distributions. Thus, the expression of JAM B is restricted to some endothelial subpopulations including high endothelial venules or lymphatic cells, whereas JAM A is expressed in platelets and in endothelial and epithelial cells. Following their transfection into CHO or MDCK cells, JAM A and B molecules are specifically enriched at cell-cell contact sites at the level of tight junctions, suggesting that they are capable of promoting cell-cell adhesion. In vitro studies indicate that the extracellular part of JAM-A self-associates as a dimer and this homodimerization seems to be required for its adhesive function and the organization of the junctional endothelial structure. Figure 4 Adhesive interactions between endothelial cells and transmigrating neutrophils. 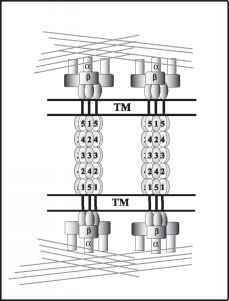 The transmigration process involves several adhesive receptor pairs. By means of homophilic and heterophilic interactions, neutrophils progress through the endothelial junctions. The first transmigration step implicates homophilic and heterophilic PECAM-1 interactions. These homophilic interactions are elaborated between PECAM-1 molecules expressed at the surface of both endothelial cells and neutrophils, whereas the heterophilic ones involve the leukocyte integrin aV|33. These PECAM-1 interactions are relayed by homophilic CD99-mediated interactions. Several interactions mediated by different JAMs receptors also participate in the transmigration, but their time course is still not known. When migrating neutrophils reach the adherens junctions where VE-cadherin is expressed, elastase and cathepsin G bound to the neutrophil cell surface can cleave its extracellular domain, thus opening their way through the adherens junctions. ß2 integrin Mac-1. These interactions significantly expend the repertoire of contacts between endothelial cells and leukocytes.